Home / Latest News / Royal Mail Postage Rates 2019 Effective From Today! Meter Envelopes can now provide you with the latest Royal Mail postage rates 2019 that are effective starting from today. 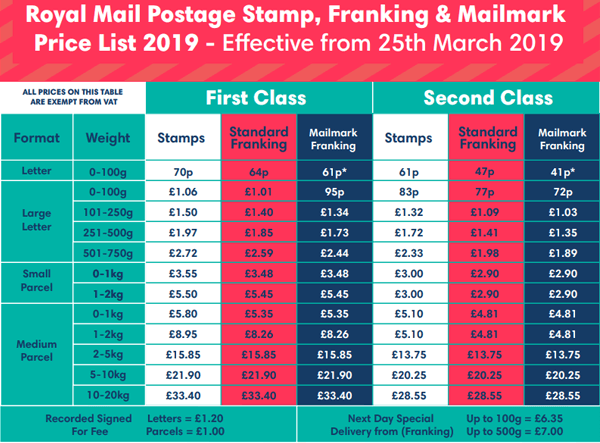 As of today, 25th March 2019, all franking machines in the UK will have to start using the latest Royal Mail 2019 postage rates. If your company have not updated your franking machine or postal scales then please contact your franking machine supplier immediately as the new Royal Mail 2019 rates should now be installed on your franking machine. Postage Rates 2019 Effective From Today! Starting from the 25th March 2019 franking machines in the UK (both Mailmark and standard machines) can benefit from the new rates. Meter Envelopes can confirm the following changes to the 2019 rates. 2nd class standard letters are now 6p cheaper using Mailmark vs. standard franking which is an increase from 5p. 1st class letters remain 3p cheaper using Mailmark vs. standard franking having been 3p cheaper over the past year. View the table below to view the Royal Mail first class postage rates 2019. Compare stamp, frank and Mailmark prices. View the table below to view the Royal Mail second class postage rates 2019. Compare stamp, frank and Mailmark prices. Download our Postage Rates 2019 PDF to view the prices a little more clearer. Top up your franking machine supplies today with low cost meter envelopes. View our range of meter envelopes here.